Grand Family Holidays at ITC Grand Goa! Goa is one of the most popular tourist destinations in India. Also known as the ‘Pearl of the East', it is best known for its beautiful and long palm-fringed beaches, Gothic churches, age-old ruins, coconut groves, intoxicating feni, and laid-back way of life. It is situated on the western coast of the Indian Peninsula and is separated from Maharashtra by the Terekhol River in the North, Karnataka in the South, the Western Ghats in the East, and the Arabian Sea in the West. Goa can be divided into four divisions - the Eastern Hills, the Central Valley Lands, the Flood and the Coastal Plains. There are several rivers and streams that flow through this delightful state and some of the famous lakes in the state are Mayem and Carambolim. Most of the rivers are navigable and of immense economic importance as ores are transported through these rivers to the Mormugao Port for export. Goa has a large number of interesting tourist sites such as forts, churches, waterfalls, seminaries, and caves. However, the most prominent of them all is undoubtedly its long and lovely beaches. Nestled in serene South Goa, amidst lush 45 acres of landscaped gardens, swaying coconut palms and shimmering lagoons - the ITC Grand Goa Resort & Spa, with direct access to the pristine Arossim beach, provides all the ingredients for an invigorating or intimate relaxed getaway. This beach-side, village-style resort's architecture draws inspiration from the Indo-Portuguese vintage and blends classical elegance with a distinctive regional allure that's infused in its service, cuisine, rituals and more - promising a truly immersive experience. The well-appointed rooms and suites look out into the lush tropical gardens, the peaceful lagoons and water bodies, the inviting multi-level swimming pool or the infinite allure of the sea. All rooms and suites feature personal outdoor spaces in the form of a balcony or patio. Some rooms also feature outdoor rain showers and secret gardens. The resort offers 6 signature food and beverage outlets along with multiple outdoor and indoor venues for bespoke banqueting, special events and weddings. Spread across 36,000 sq. ft of tropical bliss, Kaya Kalp - the Royal Spa weaves its own brand of magic on mind, body and soul. The state-of-the-art fitness centre is open 24 hours geared to meet all lifestyle and fitness goals. The swimming pool is a delightful surprise – exotically landscaped over multiple levels, with a breath-taking view of the Arabian Sea. There are scores of thoughtful amenities, like a children’s play zone where kids can enjoy and learn themselves safely while the parents immerse themselves in the pleasures of the resort. Personal nature expenses i.e. telephone calls, laundry, soft/hard drinks, meals other than included, tipping etc. This amazing family getaway starts from your residence. An ITH chauffeur will pick you up from your home to transfer you to the airport. 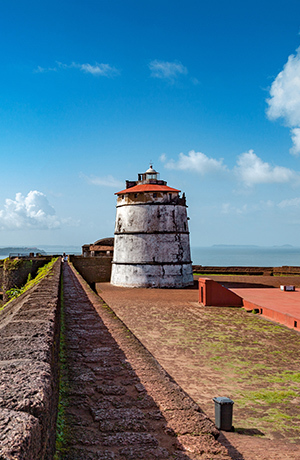 Board your flight and embark towards your exciting journey to Goa. Upon arrival at Goa Airport get transferred to ITC Grand Goa Resort & Spa by the resort’s air-conditioned coach. Check-in to the resort and enjoy lunch (depending on flight arrival timings). Rest of the day is free for leisure. You can enjoy the activities available in the resort. Kids can enjoy in Ollie’s Club which is a special place dedicated for kids, where they can play safely under the affectionate eyes of trained staff. This is the kids’ own domain, where they will be greeted by arts and crafts and pottery classes, cooking lessons, a movie room and much more. In the evening enjoy buffet dinner at your resort. Overnight stay at your resort. After breakfast proceed to explore South Goa. Visit the Basilica of Bom Jesus and Se Cathedral. Later visit Shri Shantadurga Temple and Mangeshi Temple. Return to your resort to enjoy lunch. Time to relax. In the evening enjoy buffet dinner at your resort. Time free to enjoy the resort’s famous Spa. Buffet lunch at the resort. Buffet dinner at the resort. Buffet breakfast at the resort. After breakfast. Check-out and transfer to Goa Airport to board your flight back to the city. Meet the ITH chauffeur at your city airport and get transferred to your residence. Prices may vary depending on the date you select.